We like to keep active the year around, and in Sweden we have the saying “there is no bad weather, just bad clothing”. To know how to dress in cold climate and what will keep you warm and why, that is the key. 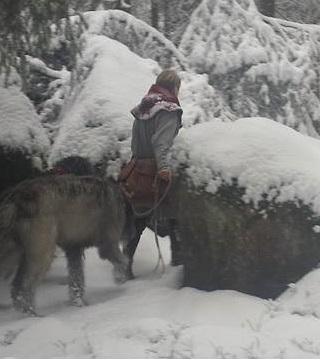 This article will be about HOW to keep warm, not just how the medieval people did it, but general tricks about how to be outdoorsy in medieval clothing. 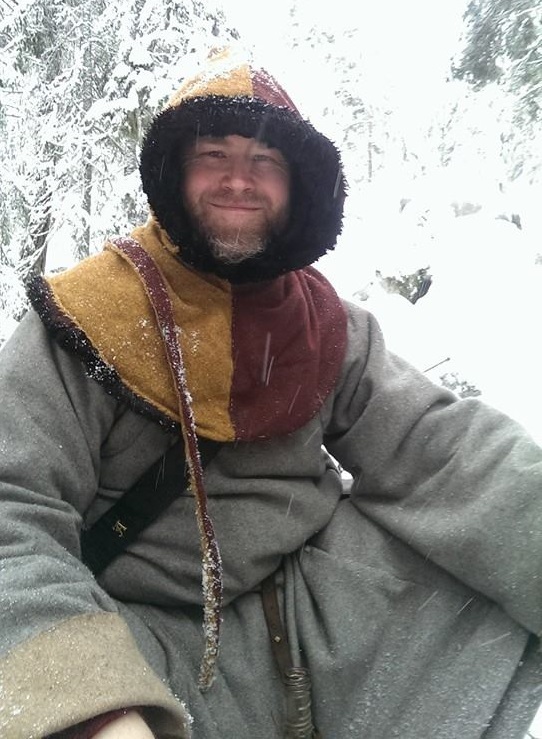 In the middle ages people where out and about in wintertime. 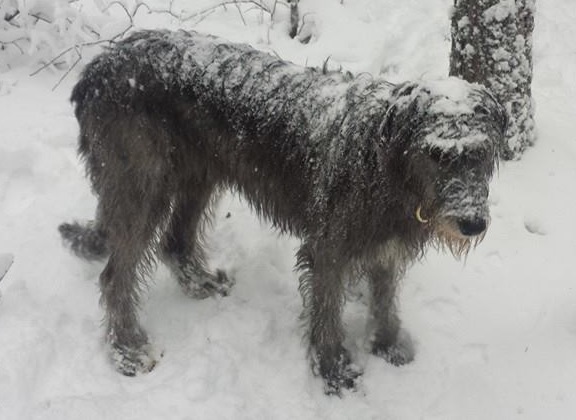 These days we often think of winter as a troublesome time of year. But the medieval person did not really share this and in Sweden winter was a preferred time of travel. 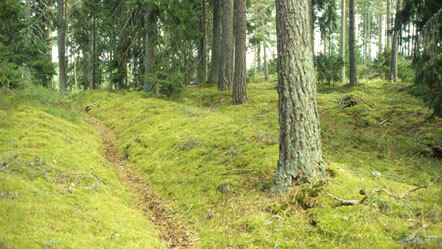 The medieval ‘roads’ up here through the great forests where nothing more than tracks. Mostly orientated to the high ridges as to not become rivers in periods of heavy rain. Most modern hikingtracks are bigger then medieval roads. Keeping to high ground also meant that the meandering roads had alot of ups and downs. In wintertime the landscape was completely different. The frozen rivers and lakes became virtual highways. Flat, straight surfaces to use sleighs or to ski on and most places where situated along water and easy to get to. In old itineraries (descriptions of how to travel. the forerunners of maps) you often see two sets of descriptions, winter road and summer road. The winter road is always about one to two thirds faster. 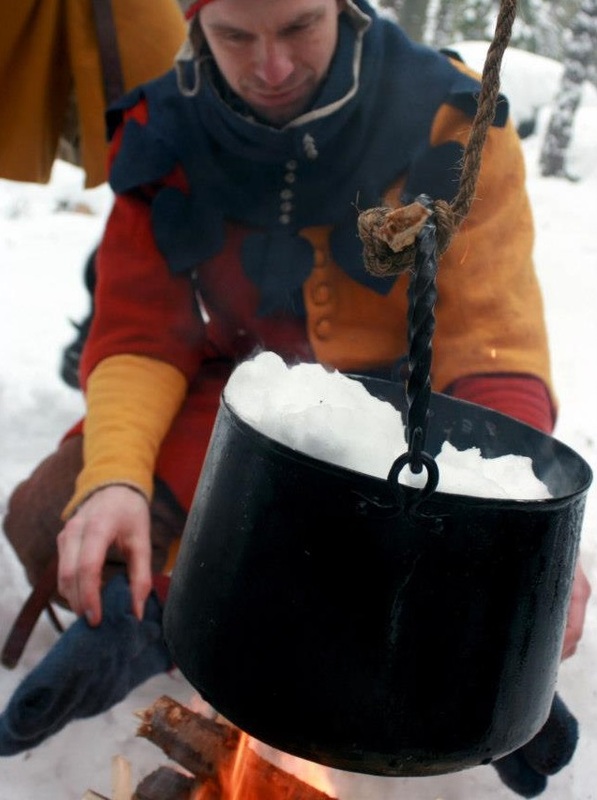 When the swedes themselves could choose, they also liked to wage war in winter. In winter the farmers was not needed to tend crops and where free to go to war in another way. 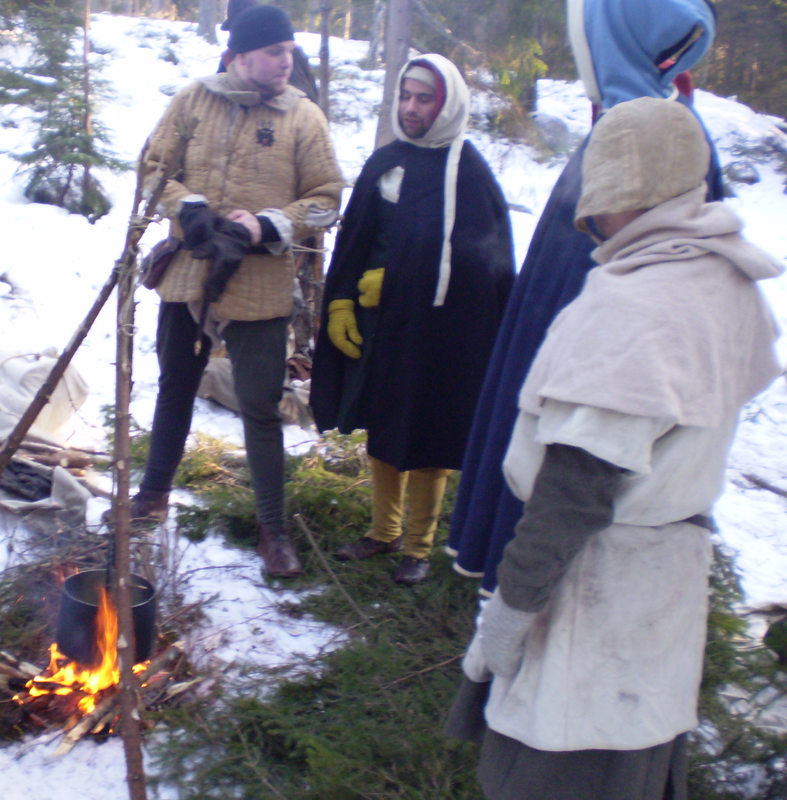 (Swedish army was based on the levy of farmers. Well equipped and free men with regulated service to the crown). There is basically two things that makes you warm. Activity, making your body generate heat, and air, that insulate from the outside cold. You mostly get cold from being wet. As the moist evaporates from your body it cools it. You also get cold from the wind blowing away the air that the body have heated. Actually one of the more common reasons people are getting cold is because they are wearing to much while being active. This makes them sweat and thus wet. When being active, that is walking, you need to regulate your clothes. Being to lazy to do this WILL punish you. When you get hot, remove clothing. As soon as you stop for longer than five to ten minutes, you will need to strengthen your clothing to preserve the heat generated. A coat or a cloak will be good for this. Many will feel to tired to root out a coat for what they think is a short break. Don’t be that person. Getting cold means loosing energy, so you will only get more tired the colder you get. Heat is energy. To produce energy your body needs fuel. You need to eat regularly and drink more then you think. If your belly is full you will have fuel to burn. Technically it takes energy to heat and to cool food to body temperature so eating hot food is in a way a energyloss (lukewarm food and drink being the most efficient) but the psychological effect of having warmth spreading from inside is often more desired. Cold feet but a hot head? The body, as we now know produces heat. But it does so to keep you functioning. Thus it will prioritize keeping the parts of the body hot that is essential. This is firstly the head where your brain resides, and the torso, where your vital organs are. Extremities are not considered vital for your lifesupport. This will mean that if the head is not warm enough, the body will start to redirect heat (blood-flow mostly) from the extremities. Your feet first and then hands and working its way inwards progressively. Helping the head to keep warm will in essence help you to keep your feet warm. The body will not have to prioritize heating the head. So, you will feel cold in your feet, but not your head, because the head is getting the heat from your feet. Warming the head will let the feet keep their allotted warmth. The body have ventilation-points. The most used ones are located on your wrists, your neck, your temples and the jugulum (the hollow where the collarbones meet). As people in hot climates know, pressing cool clothes at these area will cool you down efficiently. The same goes with warmth. It is efficient to warm, that is cover, these and thus reducing the ventilation. Snow that falls on you, either from the clouds or from branches dumping their load, should be brushed off straight away. The snow in it self is cooling and it will also make you wet when it melts from your body heat. Help each other out and brush off snow that the other can not see. This is equally important with your shoes, pick out lumps of snow that has ventured inside them. Materials in the clothing is a vital part. It all comes down to getting wet again. You will get wet, no matter how you act and how the materials in your clothes react when wet is vital. You want to have wool. Wool have several features that makes it a very good material.It has a natural fat (these days often washed out, but it can be refatted) called lanolin. This makes it naturally water resistant. Wool is also able to soak up as much as 30 percent of its own weight in moisture without feeling wet. When it gets wet, it channels the wet to its lowpoints making the hems of the garment heavy with water, but the upper parts almost dry in comparison. Also, and this is the most awesome part, wool warms you when it is wet also (!). In comparison cotton is about 150 times more cooling when wet then when dry. Now, the most amazing part… Wool fibres are made up of cortical cells, and these cells are wrapped in cuticle. This scaly outer layer is then covered by yet another layer, the epicuticle — a filmy skin that helps to repel moisture. What’s more, the epicuticle also helps out in high humidity because it has tiny pores that draw in the moisture vapour to the centre of the fibre where it’s absorbed by a chemical process. The hydrogen bond of water, H2O, is actually broken, creating a chemical reaction with the wool fibre molecules to generate heat when it has taken on a lot of moisture. (taken from how stuff works). If wool is also fulled (hard felted), it repells water even better, but looses some of its ability to bind air. But this is countered by…. 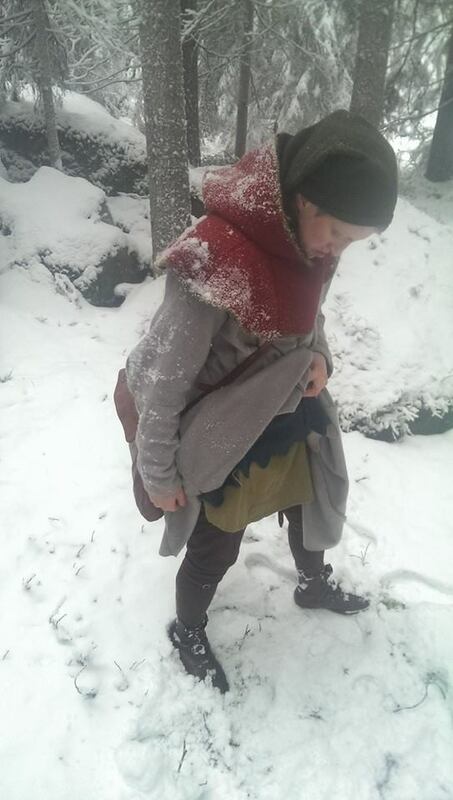 To trap air and keep warm, and also to be able to easily regulate your clothing to your activity (as covered above) you use layers of clothing. Ultimately you have a thinner closest to your body (I generally don’t use linen shirts at all in the wintertime as they just get wet and don’t have the moisture retaining quality of wool). Over this you have a more loosely woven woollen cotte, also loose in it’s cut, to trap air warmed by your body. Over this you use a fullered cotte to resist the weather and also to keep the wind out. When standing still you have a coat or a cape to reinforce the layers of trapped air. Another way of layering is…. Lining your garments allows you to combine two garments essentially. You can create a pocket between them making it two cottes in one, but you can also line with fur. Fur needs no closer explanation really.. It is vastly superior in binding air. Some fur even has hollow strands and will be very hot indeed (reindeer for example, has hollow hairs that allows you to sleep directly on ice on a fleece). In medieval times there are nothing in pictures pointing towards the wearing of fur with the hairs out. When this is seen on paintings it always shows heathens, or wild men. Those that are not part of the culture and the ones you define yourself as not being. 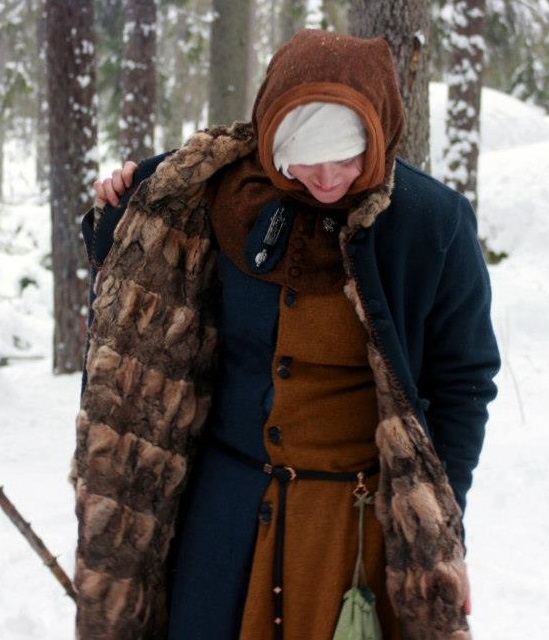 Eva Andersson, dresshistorian with special edge towards medieval clothes, have seen some evidence of this in the north though. There are examples, both written and in pictures, of lining your clothes with fur. But as there is mentionings of bear it is possible that this was worn as a “fur outward” coat, as it is a fur that is very heavy, thick and hard to line a garment with. This might also apply to wolf (depending on witch part of the wolf is used). You had to be a bit careful though, as it was thought that you could emulate the characteristics of some animals via some kind of fashion osmosis. Lining with another layer of wool, or preferably, with fur is a very good and medieval way to keep warm. Note that this refers to cottes and hoods, I have yet to see evidence of furlined hosen or shoes. The aforementioned Eva Andersson have been looking at medieval testaments in regard to clothes. According to her squirrel is the most common but marten gains popularity in 15:th cent. amongst the burgers lamb/sheep was popular and also rabbit, ferret (polecat) otter, wolf, reindeer and bear are mentioned in some cases. (På svenska; ekorre, mård, lamm/får, kanin, iller, utter, varg, ren och björn.) 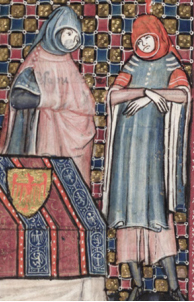 Edward Of Norwich, in Master of game, say that wolf is good to use in cuffs, or pelisses. For this, especially ‘cuffs’ he also recommends fox. So, lets take a look on how medieval people might have tackled the above problems and solutions. As we already covered in the ‘layering’ part. you will get along splendidly with just some extra cottes. Two or three is usually enough up to -15C or even -20C . Just think about not having to tight clothing. And Wool. Always wool. The hood is very popular and is excellent in some ways. The collar of the hood keeps the bodyheat that raises from the body, and collects it. The hood in it self is covering the ventilationpoints in the temple, the neck and the jugulum. The hood also keeps the air warmed of the head in close proximity to the face, so the wind don’t blow it away. 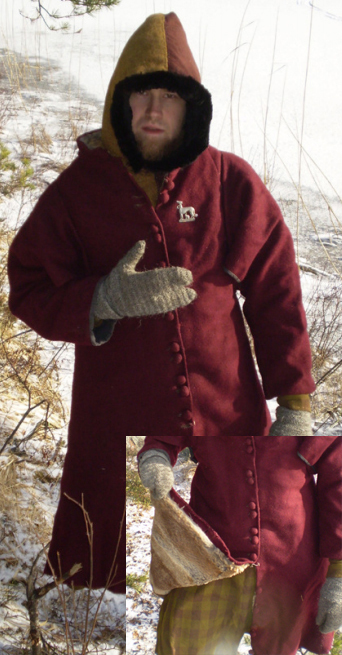 When worn with a cloak or coat, it seems that it is common to have the collar of the hood inside the coat. So far I have seen no evidence of any special ‘wintershoes’. 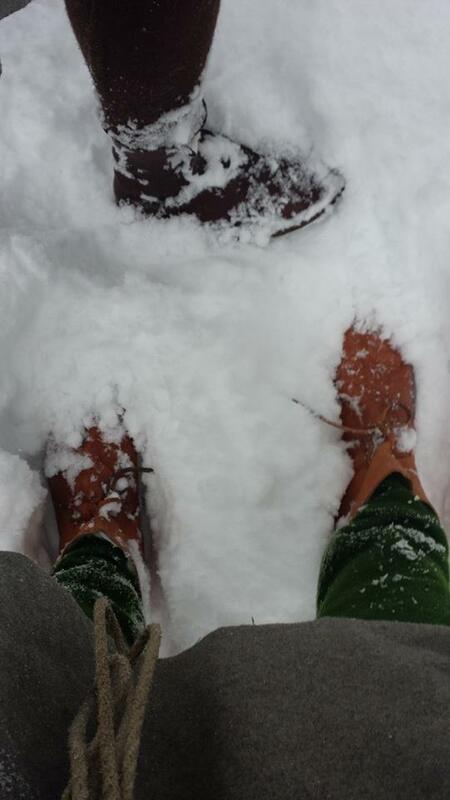 The thing that is needed by shoes in winter is that they are big enough to make room for socks and extra hosen. There is some evidence that higher boots might have been of this kind, that is bigger to allow the use of socks. There is no difference in the feet as opposed to the body in regards to what makes you freeze. Trap air and keep dry. if there is dry snow, as it is when its more then -2 C you can actually just use several socks, without a shoe. The key is not to cram socks into a shoe that is not made for it. This will only compress the sock and make the air it is able to hold less. It will also press on your foot and reduce the bloodflow thought it. This will also make the foot cold as bloodflow is vital to keep warm. A well greased up shoe will, of course, keep water out better (I usually make a shoefat of sheepstallow, beeswax and tar) but if it is wet out, the shoe will get wet sooner or later. Stuffing materials into the shoes to isolate from the cold is also a method that was used. One of our readers, Nicolas Hofbauer, pointed us to a german poem from 13th century; “Meier Helmbrecht” where there are peasants mentioned “who dance so wildly that the straw comes flying out of their boots”. We also know of ‘bootstraw’ from later times. There is even a grass here in Sweden called ‘shoegrass’. 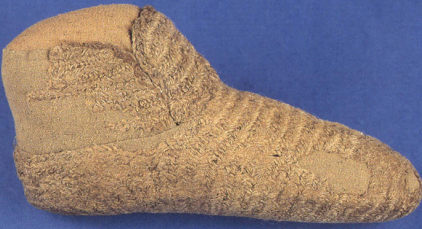 There are finds of wool thats seems to have been stuffed loosely into the shoes and then felted together in the shape of the shoe (they have found the felted wool). Socks are in use for reinforcing the feet. These are made with naalbinding, knitting is not used in Europe at any bigger extent at this time. The knitted socks that are in existence seems to be very fine and for the very top classes of society. Naalbinding is a very old technique and seems to have been used throughout the viking- and medieval age. To get to know more about naalbinding you can follow this link. Also there is some suggestions of sewn socks that are shorter then normal hosen. 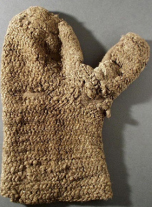 The Bockstens man, one of few full medieval clothes ensable that have been found from 14th century, wore patches of cloth, footwraps, (fotlappar in Swedish) that was made from old used clothing and then cut into squares and wrapped around the foot. He used three to six wraps. of all kinds was in use. Either five fingered or threefingered of thumbed. The threefinger glove seems to be more common on males then females. The materials are probably cloth, naalbinding and some in leather. The leathergloves are often interpreted as workgloves. There are some gloves that show signs of fur lining, but these are rare. Bigger coats are great for when you stop to rest. Testaments (wills) shows that these are inherited between sexes. This might show that men and women alike could use them, or just that they where deemed valuable. Many coats have a slit in the arms, allowing you to stick the arm out if it becomes to bulky. Coats are often better then cloaks as they don’t open themselves and let the air out when you move. Cloaks are maybe not as popular as coats in the 14:th Century. But they are used in rough and wet weather. Most common is to wear it buttoned on one shoulder and seldom longer than below the knee. 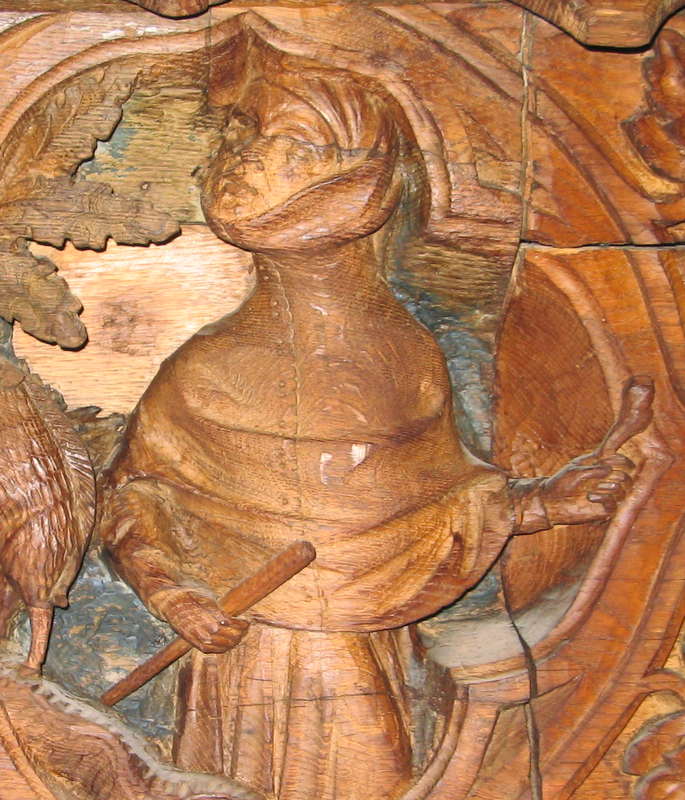 This hood is often shown on shepherds. it is a hood with a longer collar to it. almost as a short cape. They usually are as long as to go to the wrists of the hands. Our friend Vix have written an extensive article about these cloaks that you can read here. Although snow is water of a sort it is not always suitable for drinking. First of all, it cools you, and secondly its dry and don’t quench the thirst as good. 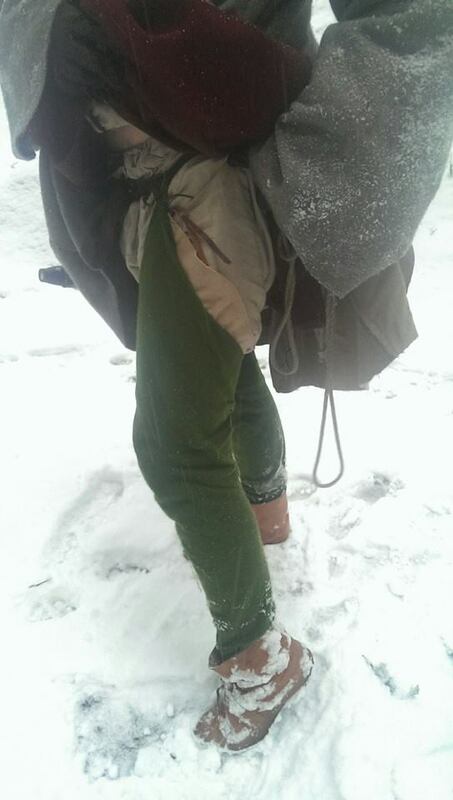 For cooking, snow is excellent though, so there is no lack of water when in camp where there is snow. One problem that we have encountered is that the water in the leather canteens freeze. This results in that some of the canteens, that use a cork, was frozen shut and could not be opened at all. The one using a wooden plug could be pried open and the layer of ice that had formed inside hacked through with a dagger to get some drinking water. with modern bottles you usually carry them inside the clothes to keep them from freezing, but as almost no leathercosterel is safe from leaking, this is not recommended with them. Wear wool, wool, and only wool.